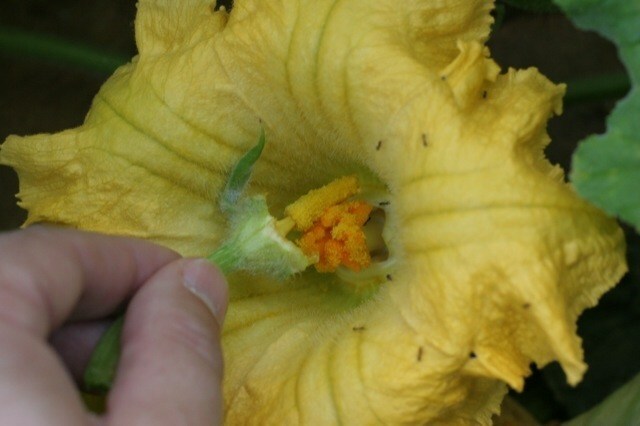 My article on hand pollinating zucchini flowers proved very popular, so I figured I’d post another on hand pollinating pumpkin and squash. It’s pretty much the same principle, but I had the photos so I thought it worth posting. 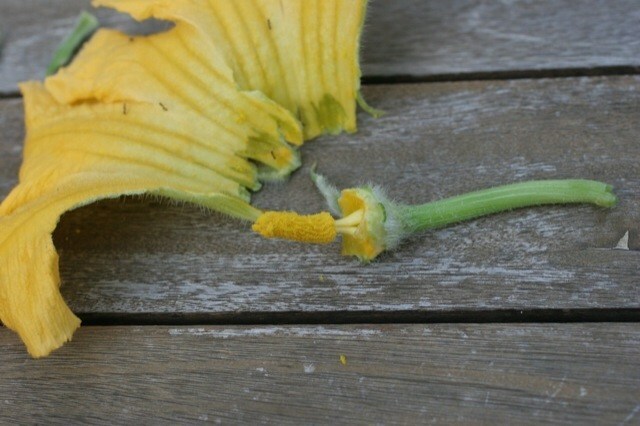 As for the zucchinis, if pumpkin and squash flowers don’t get pollinated they’ll just rot and drop off the vine. And for some reason, the bees just didn’t seem to be pollinating them this year so I’ve had to do it myself. 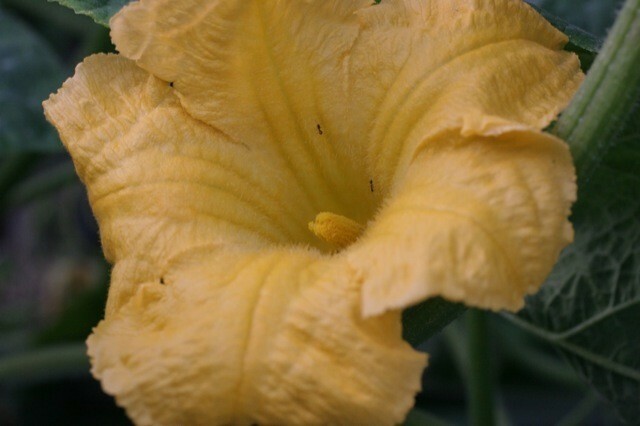 Pumpkin and squash flowers are a lot like zucchini flowers, but here are some photos as a refresher. These photos are all of my butternut pumpkins (I think Americans and Canadians call them butternut squash?). Click on them to see larger versions. If you do this each morning, it won’t be long until you’ve got a healthy crop of pollinated fruit growing! 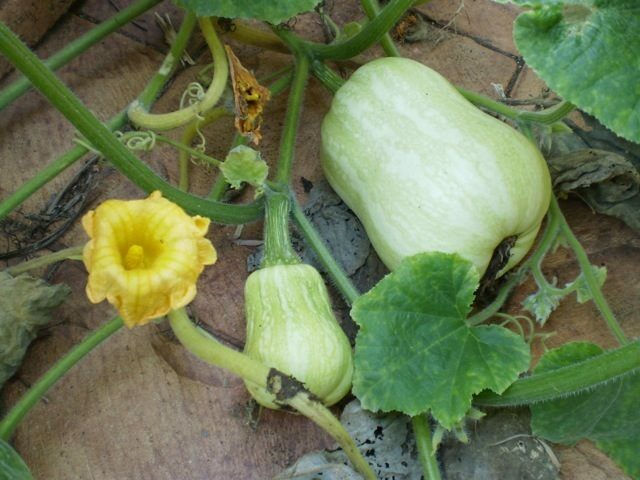 If you intend to save seed from your pumpkins or squash, it’s a good idea to take some extra precautions to ensure you get a pure pollination and not a cross. Take some masking tape out in the afternoon, and put tape around the ends of the male and female flowers that are ready to open the next day (after a while you’ll be able to spot them). The next morning, remove the tape and pollinate the female flowers, then tape them up again. This ensures that you have complete control over what pollen goes into which flower, and the bees don’t get a chance to muck up your plans. G’day Darren, how’s it going? Just came across this project. It’s about mapping feral fruit trees on google earth. I’m editing your interview atm, so have been listening back to it, and you said you were beginning a map. Well here’s one everyone can add to. Live Local looks good. When I get some time, I’ll join up and post some stuff. @Michael: Great stuff! They’re so easy to grow and give a huge crop. Yep, the runners can get really long and take over your garden. For most varieties, you can cut back the growing tip when the vine gets as long as you’d like it. Some will sprout side-shoots, and others will just start putting their energy into producing flowers and fruit. Some varieties seem to have little prickly hairs on the leaves. I think they stick into your skin and break off, leaving you with an itch. Rub the area with a pumice stone next time you’re in the shower, and it seems to get rid of them. Thanks for the info. My pumpkin weighs 40lbs. I only had two that developed into pumpkins and I had three vines. I am so happy about the 40 pounder. The other one weighs 16 lbs. I feel like I should enter it in the fair. The vines were huge. I teach first grade and we started the vine in class and then transplanted it to my home. I was wondering why there was not more fruit. We will have a fun Halloween. Thanks..
@poomccool: Wow, that’s huge! I bet the kids will be excited to see it. When a vine only sets one or two fruit, it really puts all its energy into growing them, which must be why yours have turned out so big. I’d love to see a photo of what you do with it at Halloween! Sick sick sick!! First you cut off the male appendage, then proceed to force it onto the female, criminal!! I’m calling the authorities, plants shouldn’t be mistreated this way. @Joker: There’s worse carnage and mayhem going on in the garden, I just haven’t photographed it all yet :-). Great article! Is there a way to tell the day/night before when a female flower is getting ready to open? Also, how early do you have to get up to catch the female flower while it is open? I heard they only open in the morning for a few hours. I’ve done the hand pollinating, seems to work well. 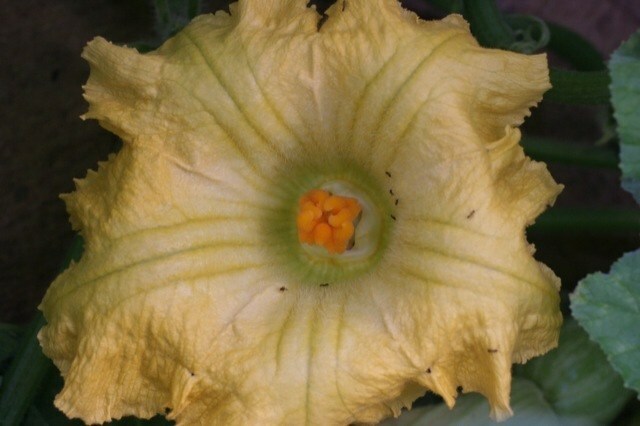 My problem, or rather that of my squash plants, is that there are many more male flowers than female flowers. Is there a way to entice the plant to produce more females? Thanks. @Audrey: A commenter elsewhere on this site said that removing most of the male flowers will encourage the plant to grow more females. I haven’t tried this myself, but it’s worth a go. Ok, I’ll chop off the males. Thanks for the suggestion. Hi, I found your site when I did a Google search for pollinating pumpkins by hand. 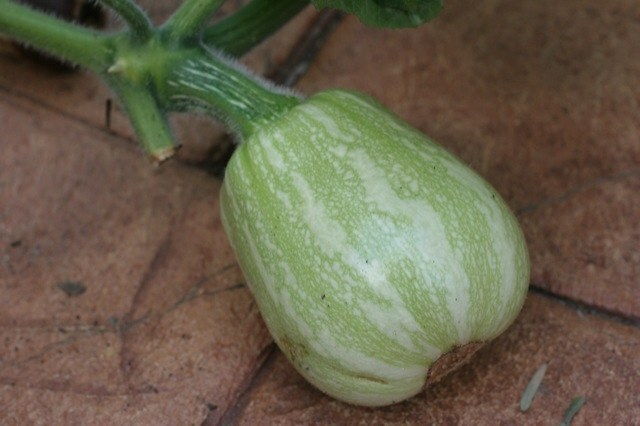 I live in Guam, which has the same climate as Cairns, and I am trying to get my pumpkin plants to bear fruit. Thanks so much for posting the great photos and great advice. Last night after I read the above, I went out to look at the flowers that were about to open and I found that I had 13 male and one female flowers. I used the masking tape as suggested and this morning I pollinated the female. I cut off all of the males and hopefully I will get some more females. @Barbara: Good luck! It sounds like you’re doing everything right and should have some pumpkins soon. Hi Darren, I checked this morning and yes I have a pumpkin! I just hope that I get more females. @Barbara: Great news! I have some developing now as well, thriving on the nutrients washing downhill from the chook pen above. I read somewhere that it’s a good idea to cut the growing tips off the vines once they fill your garden bed – not only does it stop them spreading, but it will encourage more female flowers. Might be worth a try. I was told that as well and I plan to do that today. I have a real problem with snails so my pumpkin plants are growing on a fence. I have been giving them 10-20-20 and they seem to be doing well. @Barbara: Here’s a good way to deal with snails: Backyard Escargot :-). Can you freeze the pollen? I’m worried I won’t have a male flower on hand when I need to pollinate a female flower. @Anja: I don’t think you could freeze the pollen, but then I’ve never tried. If you plant a few plants, you should have enough flowers most of the time. If your plants are still young, don’t worry too much – they’ll grow lots more flowers as they get bigger. I have huge zucchini plants that have way too many males and the females aren’t producing. Thanks for the fantastic advice on dealing with the too many males and unproductive females situation. Any advice about pruning the gigantic, extremely prolific leaves? @Deni: If they’re not getting in the way, I’d leave the leaves to grow. The more leaves, the more sunlight the plant can turn into food and the more fruit it can produce. I am glad I stumbled along to this sight, I was actually trying to figure out if Pumpkin is frost toerate or not. 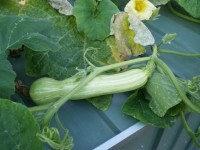 Since you mention Zucchini’s is it normal for the flowers to bloom then by evening start to close back up? I am so glad that I found this discussion. 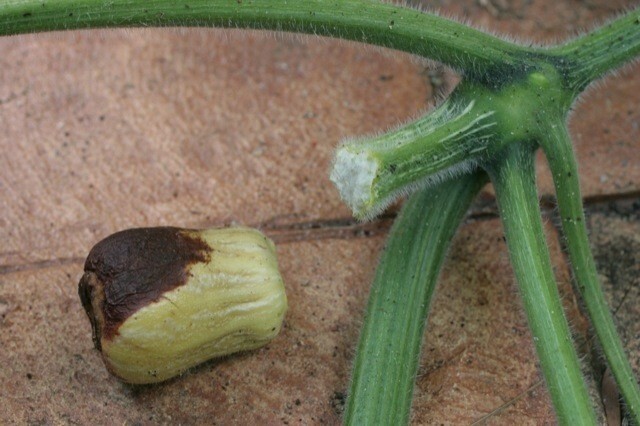 Today I manually pollinated a squash flower for the first time, since I have always had a problem with baby squashlets dying from lack of pollination – even tho there’s always lot of males. I don’t know why the bees aren’t doing their duty, ‘cuz there are some in the garden. Now, I am going to try euthanizing some male flowers and see if I get a few more females. Thanks for this forum and all your advice, all of you. Hi Darren, Forgive my ignorance, but what is cross pollination and why is it detrimental to the plant? Thanks! I forgot which was which. Very good job! You kept it simple and quick. I’ll post an update here about how the pumpkins go! 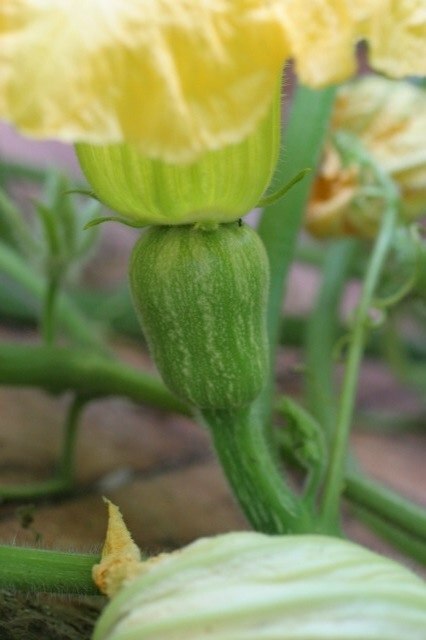 I was just wondering, my pumpkin plant has no female flowers at all…….loads of male flowers but not one flower. Is there anything that I can do to try and encourage the female flowers to grow or do I ditch this attempt and start again? @Angela: I wouldn’t ditch it, it’s quite common to just get male flowers only at first. Once the plant is large, it can help to prune the growing tips. This will encourage it to spread laterally, and it will often put out female flowers then. 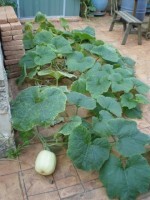 One of my current pumpkin vines covered about 20 m2 or more before it had set any fruit at all! It’s now got at least a dozen good-sized pumpkins. @Tyler: Sorry to hear that. Hopefully you’ll get some more develop soon. @Axel: Yep, like most species, once the pollination is done the male is no longer needed! It’s the females that will turn into the fruit. You can eat the male flowers, though. @Hellann: I let as many pumpkins grow as I can. This year I got 14 pumpkins from 2 self-seeded vines, which was great! If you’re growing for size (e.g. for competition), then you would let a few pumpkins start and then select the best-looking one and prune off the others. Don’t forget to give the plant plenty of compost and liquid fertiliser, as they get pretty hungry when they have lots of babies to feed. My kids and I are growing pumpkins (5 plants) in a square foot garden with one plant per square and the vines are doing well. The base of the vines are dark green, round, and thick. All of the plants have been producing nice big leaves and many male flowers. We recently got some female flowers/pumpkins (one per vine) about a week or 2 ago but now they are turning yellow and starting to fall off! And the flower hasn’t even been close to opening! What is going on?!? I have been giving them an organic fertilizer (2-3-1) but not a lot. Am I watering them too much? If they do fall off, should I rip out the vines? 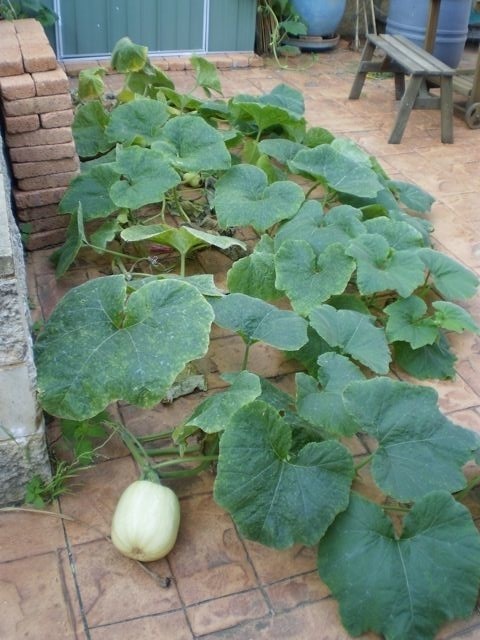 @JoeM: I think one pumpkin vine per square is probably a little tight – they are hungry plants with spreading roots, and I’d be inclined to give them 4 squares each with lots of compost. I can’t remember what the Square Foot Gardening book recommends for pumpkins, but I’d be interested to hear how your plants go at that spacing. The fruits that went yellow sound like they weren’t pollinated. Perhaps temperatures weren’t quite right for the female flowers to open properly. I wouldn’t worry too much if the vines aren’t all that old – be patient and see what happens with the next set of flowers. Don’t rip them out just yet! Ok, so advice please…If the vine won’t grow down, I could make a sling type thing. Do the pumpkins have to grow on the ground for some reason? Will just supporting it be ok? I am thinking of something fine like nylons. I don’t want the weight of it to break it off. @Hellann: I’d let it climb the trellis. One stem of my pumpkin vine went up a tree, and I let it go to see what would happen. It grew a pumpkin up there that got to around 6 kg (12 lbs), and it didn’t break the vine. In fact, the pumpkin looked perfect because no part of it had been resting on the ground! Awesome! Now I want to try that..lol. Just don’t stand under it, just in case.. =D I think I’ve found what I love to grow.. pumpkins! =) BTW, I have 4 more females on the way. I’ve put the a couple of males in baggies in my fridge (not freezer)for just in case. (learned that tip from a ‘master’ gardener). Thank you so much for keeping up with this discussion! You’ve been a tremendous help. On an off note, I harvested my first kohlrabi yesterday! YAY! @Hellann: That’s a great idea about saving male flowers in the fridge! Thanks for sharing – I’ll have to try that this spring. Kohlrabi is something I haven’t grown before, but would like to try. I think you are also right about the spacing. The square foot gardening site recommends one plant per 2 square feet (two 1 foot squares next to each other) so I should be doing at least that. I think the plants are too close together and the roots are fighting for space. So next yeat, I will do that and add compost to the soil, which I didn’t do this year (Duh!). Some reccommend adding peat moss but I’m not sure about that one. Anyway, let’s hope the other vines come through with a new pumpkin soon. @JoeM: Glad to help! It sounds like you’re off and running now. Enjoy those pumpkins! I’m glad I came across this site! I have a mystery vine growing in my garden. It looks like zucchini, but it may be some kind of winter squash (or pumpkin, as it seems to be called in your part of the world) for all I know. How can I tell? Is it only male zucchini flowers that are edible? I mean, are female flowers edible too? 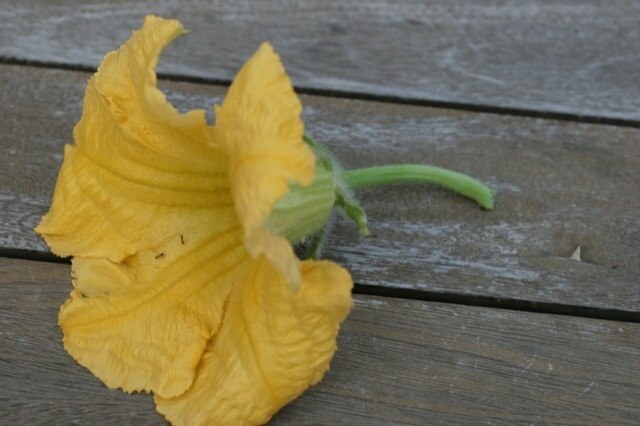 And if it turns out to be a squash/pumpkin plant that I’ve got, is it safe to eat the flowers anyway? 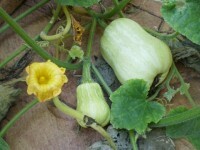 @Nick: The female flowers are edible, as are other squash and pumpkin flowers. The only real way to tell what the vine is, is to let it grow some fruit and identify them.